There is a new addition to Nina’s family for the moment and she encourages everyone to Adopt Don’t Shop as she posted photos on her Instagram Story yesterday of dogs displaced from the woosley fire. If you are in the Los Angeles area and have the room be sure to stop by a local shelter and check out the animals there, they need a home and could use your love. 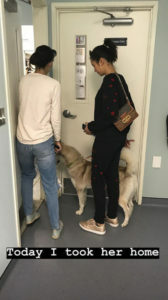 If you are unable to take home an animal many shelters can use donations as there is still plenty of work to be done, the care for the animals is not even near over yet. Be sure to research before giving here is a list of some good organizations to give too. 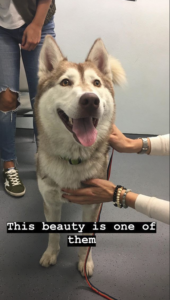 This is a beautiful thing that Nina is doing check out the photos below along with a video featuring the clips compiled together from Nina’s instagram story featuring her foster dog.